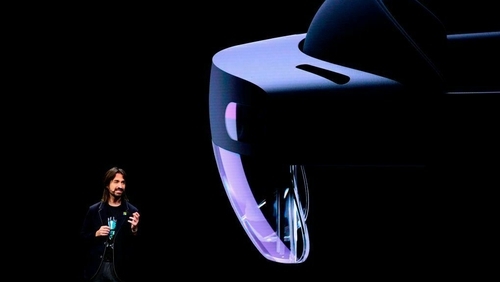 Microsoft has unveiled a second generation of its mixed reality HoloLens headset, which overlays holograms on to real-world objects. The HoloLens 2, which will be made available to businesses for $3,500, with Microsoft looking to "provide a far more immersive, instinctual and comfortable experience for first-line workers whose hands are occupied by physical tasks". Revealed on stage ahead of the Mobile World Congress (MWC) in Barcelona, the technology giant said it had increased the number of apps that will be available to HoloLens users, as well as made holograms larger to improve interactivity." For the first time, you're going to feel what it feels like to touch a hologram, to interact with a hologram and to play with it, almost where you forget that this is a piece of digital content you're looking at as opposed to it just existing in the real world," Microsoft's Alex Kipman said. "The promise of mixed reality is that all of these devices are lenses into this connected content that exists in the world. "Let's say I want to place a hologram in the middle of the room. If I leave the room and you come in with your HoloLens or your phone or your tablet, should you see the hologram? Assuming privacy and permissions all apply, the answer is yes." Unlike other virtual and mixed reality headsets, Microsoft has targeted their device at enterprise as a tool to help employees do their jobs. The new version of the headset is lighter, more comfortable and has had its field of view doubled, Mr Kipman said. "We put our hearts, bodies, souls and all our waking hours into creating this vision and bringing it into practice," he said. "This is now the moment where we get to see how this technology empowers our customers to compete, to digitally transform, to achieve something they weren't able to achieve before, to do something that we've never imagined. All of those things I'm excited about."